I was a little bit late to post this article. This should be published by this morning or afternoon, but here I am, still doing it up to this night. I didn't mean to be late. It happened just because it should be. God's plan, I guess. You might have known that I blog mostly with my cell phone. I enjoy this 3,5 inches flat thing. I have done this for 4 years with the same phone. I write, take and store pictures and do social media with it. In short, my virtual world is this small handy gadget. I have written a draft for today's article using Memo, an app that's originally installed in this android phone. I looove this phone so much and so does my eldest son. Yesterday morning he cleaned the phone from anything that could be trashes. My son didn't know that by doing that he erased all files and apps. I was shocked to realize that the browser and WhatsApp had disappeared. I was like, "What???" and I got more shocked when I accessed the Memo app and found nothing there. Oh My God...! It's hard to be parents. I was once such a perfectionist mom at the beginning of my motherhood journey. I was. I read books about parenting, made meal plan, and so on. I never thought raising boys are harder than I expected. Boys are active creatures. They love to run, and run, and run from here to there then there to here. They always do it except when they are sleeping and having a bath. Finish having a bath, they get back to their 'normal life' again. I really found hard times just to make them stop moving so I could dry their body and combed their hair and apply some warm traditional oil (telon oil) to keep them away from cold. They seem to have endless energy to move, move, move, and talk! Who says boys don't talk much? They do. They just stop talking when they are bigger or married. LOL. Trust me. Boys move, talk and do experiments. When they don't, I bet they may be in a not-so-healthy condition. Knowing that my cell phone was down, I couldn't do anything. I also didn't have enough power for just getting mad at my first son. I understood that he's in a very good condition when he did something shocking. So, I just sat down and thinking of how to avoid this to happen again in the future. My mom told me about her younger years with her 9 younger siblings. Everytime her mom got a new baby, she and other siblings would embrace the baby warmly. They loved to gather around the baby and took care of the baby while the mother was away for a while. My grandma got 10 children, yes, that's true. Can you imagine that? 10 children means 10 x parenting as every child has his/her own unique character. I myself have 3 sons which means I have 3 different types of kids to take care of. I wonder how moms with sons AND daughters manage their parenting style. I, who only have boys, often find hard parenting times. Moms (and dads) with sons and daughters are strong parents, I guess. Parenting is something challenging yet tiring. It also changes through times and ages. Old parenting style can't be implemented to today's children. The way parents treat their kids at their younger years will not be suitable for them when they get bigger. Parenting is always changing. It can be a stressfulling subject if it's taught at school. It can only be learnt through time. Sometimes through trial and error, with pain and tears. Don't we experience that, parents? So, is there any easier way to do parenting? Yes, there is. We, parents don't raise our kids alone. There are always help out there. There are teachers, grandma and grandpa, and God. The last one I mention is where the greatest help comes from. Dua is every muslims weapon and this is my parenting made simple. After struggling hard to be a good parent and shower my kids with love and caress, it's time to relax and pass it to The One who owns every heart: God. Through praying, we ask Allah to give us protection, safety, health, wealth and many more. By reciting that dua, we ask Him for good kids. Parents do, parents pray, that's what my mom told me. We, humans, can control our kids body but not their hearts and mind. Those are things we can't touch but God can. That's why I pray that dua. Have you, parents, experience the same thing? 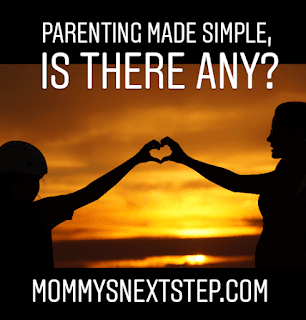 Do you find your parenting made simple style? What is it?